2019 Society Annual Meeting Location: San Antonio, Texas! The Executive Committee is pleased to announce that the Society’s 2019 annual meeting will take place in October 2019 in San Antonio, Texas. 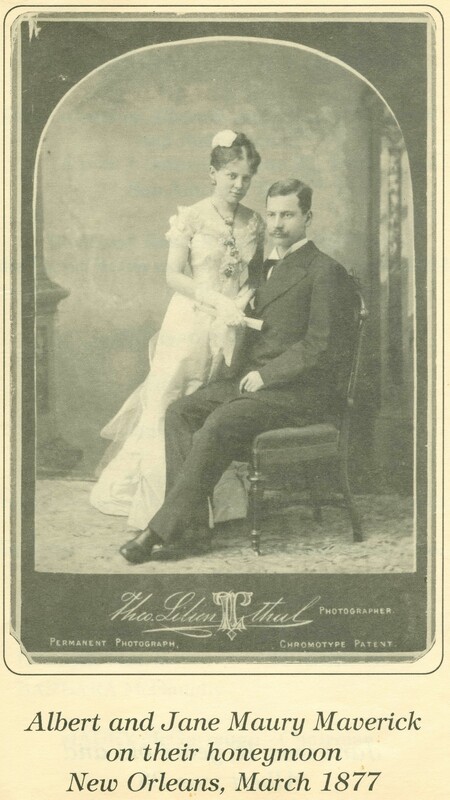 The theme will focus predominantly on two Maury sisters who “went west” from Virginia to settle in San Antonio – Jane Lewis Maury (1858-1954) and Ellen McGregor Maury (1860-1926), descendants of Mary Ann Fontaine and Matthew Maury. 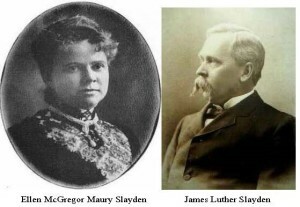 The sisters were born in Charlottesville where Jane married in 1877 with Albert “Allie” Maverick and Ellen in 1883 with James Luther Slayden. Allie Maverick was a native of San Antonio and went to Charlottesville to attend the University of Virginia; his father was a signer of the Texas Declaration of Independence and the source of the term of when someone is a “maverick.” Allie was a gregarious man and well-loved in San Antonio where he and Jane lived on the Sunshine Ranch for over 40 years, the site of many famous and large Sunday night suppers. Jane and Allie had a number of children, including Maury Maverick Sr., who was a U.S. congressman who coined the word “gobbledygook” who was later the San Antonio mayor. 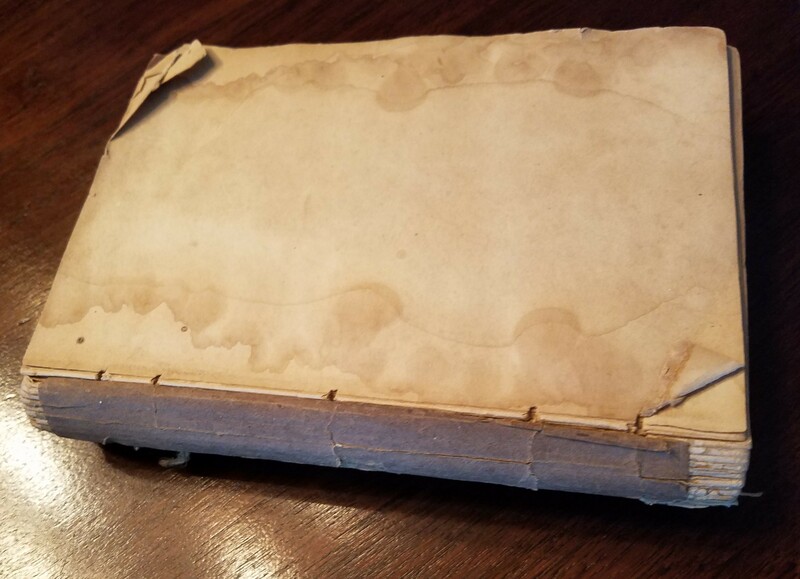 Another son George Madison Maverick purchased the Jaques Fontaine 1720s manuscript from the Minor estate and placed it in the Alderman Library at the University of Virginia for its preservation. 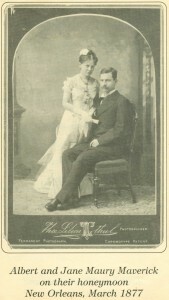 Ellen Maury’s husband James Slayton was elected to represent San Antonio in the U.S. House of Representatives in 1896 and he continued in that position for 22 years. They had no children. Both sisters were published writers. Jane Maury Maverick wrote several books, Mission San Jose and A True Romance of the Alamo. Her husband Allie wrote A Maverick Abroad: Foot Travels in England and France. Their son James Slayden Maverick wrote Maverick Ancestors of the Maverick Family of Texas and their great-granddaughter Ellen Maury Davis Cassidy compiled the book, The Mavericks of Sunshine Ranch: Writings of Jane and Albert Maverick and their Granddaughter Mary Maverick McGarraugh. Ellen Maury Slayton wrote a journal that was published posthumously as Washington Wife: From the Journal of Ellen Maury Slayden from 1897 to 1919 about her life in Washington, D.C. Among the places we may visit during our weekend include land that was part of the Sunshine Ranch, St. Mark’s Episcopal Church, the Albert Maverick Building, Mayor Maury Maverick Plaza, and the cemeteries where the two sisters and their husbands are buried. There are other Fontaine and Maury ties to San Antonio including several family members from different branches who went to San Antonio which was the assembly point for troops for the 1848 Mexican War. Please check back for more details as we have them. For now, please mark your calendars for an October 2019 visit to San Antonio! The Society had our largest crowd ever at our annual meeting weekend with over 80 attendees! Our weekend formally began on the evening of Friday, October 19, 2018, but many of our attendees arrived early to attend the annual Yorktown Day celebrations and to attend a special exhibition for our Society at the College of William & Mary. Yorktown Day commemorates the October 19, 1781, British surrender in the American Revolution with a parade and a number of wreath-laying ceremonies. On Friday afternoon we had a special treat as the Special Collections Library at the College of William & Mary hosted an Open House for us at the Swem Library where they had a number of original Fontaine and Maury family documents on display as well as original letters from Thomas Jefferson, James Monroe, John Marshall, John Tyler, and George Washington, and Marquis de Lafayette. Over 50 Society members attended this special exhibition. Our business meeting was held that evening at the Fort Magruder Hotel and Conference Center in Williamsburg, where we were based for the weekend. The hotel’s name has an ironic connection to the Fontaine family. Major General John Bankhead Magruder was a Civil War military leader who was involved in the defense of Galveston in 1863 where he met Sidney Thurston Fontaine, grandson of Aaron Fontaine and great-grandson of the Reverend Peter Fontaine. In Mexico City after the end of the war he met Matthew Fontaine Maury as the two men were staying in the same hotel. When Magruder died in Galveston in 1871, he left little resources so he was buried in a plot owned by Sidney Fontaine. The Society’s officers provided their reports at the business meeting and elections were held for vacant Executive Committee positions and for those for which the terms were expiring. Members made suggestions for future locations for our annual meeting, including suggestions for sites in Florida, Georgia, and Texas. See the separate article with the Executive Committee’s decision for our 2019 meeting location! On Saturday we had a full day that began with a visit by the Marquis de Lafayette himself! The re-enactor gave us an excellent overview of Lafayette’s life, what led him to come to America to support the Revolution, and summarized that fateful day when the British surrendered, witnessed by at least four members of the Fontaine family. From there we visited the Custom House in downtown Yorktown. Built around l720, it was the clearing house for processing immigrants arriving in Yorktown. James Fontaine, his wife, and daughter landed in Yorktown in October 1717. The immigrant experience passing through the Custom House in those early days was representative of the experiences of all five Fontaine siblings and their families who arrived at various ports in the area in the late 1710s and early 1720s. From there we went to Grace Church where the Reverend Francis Fontaine was rector from 1722 until his death in 1749. He is believed to be buried in the graveyard there. We had lunch in the parish hall, after which a docent gave us a short talk in the church. She reported finding a 1724 report written by the Reverend Francis that was prepared for the Bishop of London. We plan to publish this report in a future Society newsletter. In the afternoon we visited the Yorktown Visitors Center for a brief film and a visit to the museum, followed by a special reenactment of a live firing of a British artillery unit. We then toured part of the Yorktown battlefield – Moore House where the 1781 surrender terms were discussed, the surrender field itself, and the French artillery battery. That evening we had our annual dinner at the Fort Magruder Hotel. Our keynote speaker was Jay Gaidmore, Director of the Special Collections Library at the College of William & Mary who discussed the college’s extraordinary Fontaine and Maury holdings. His talk included a presentation showing images from the collection and the university’s on-going digitation program. September 19 Approaching, Remember to Sign Up for the Annual Meeting! Our annual meeting is October 19-21, 2018, in Yorktown, Virginia. Please make your hotel reservation at Fort Magruder Hotel in Williamsburg, Virginia, by September 19 and remember to ask for the Fontaine Maury Society (FMS) special rate! Please also mail your registration form directly to our Society’s treasurer by September 19 so we can finalize all our plans with an appropriate head-count. Details are here on our announcement page! See you in Yorktown! Please plan to join us for this year’s annual meeting the weekend of October 19-21, 2018. Our weekend will be based at the Fort Magruder Hotel and Conference Center, 6945 Pocahontas Trail, in Williamsburg VA 23185. The hotel has offered the Society a special group rate of $109.00 per night. With the 12 percent state tax and a $2.00 occupancy tax, the total will be $122.08 per night. The hotel rate is applicable for two nights prior to our weekend and two nights after, for those who may want to spend more time in the area. A complimentary continental breakfast will be included because the hotel is under renovations; if renovations are complete by the time of our visit, there will be a charge for breakfast. For your convenience a list of local places for breakfast will be included in your welcome packets when you arrive for the weekend. All rooms include complimentary parking, Wi-Fi, mini-refrigerator, coffee-maker with teas and coffees, hair dryer, and iron with ironing board. The hotel also has an ATM, business center, dry cleaning service, 24-hour access fitness center, heated indoor pool, and guest laundry facility. Please make your hotel reservation directly with the hotel by September 19, 2018, at 757-220-2250, Info@fortmagruderhotel.com, or via the hotel’s webpage. Please remember to ask for the Fontaine Maury Society group rate! Our first event will be our business meeting on Friday night, October 19, at 7:00 pm in the Petersburg conference room in our hotel, after dinner on your own. That day will be a busy one in Yorktown as it will be the annual Yorktown Day celebration, commemorating the British surrender at Yorktown. You may want to come early for our weekend to enjoy those festivities that include a number of activities that morning. A separate posting follows with the list of activities that day, October 19. We have a special treat for Friday afternoon for those of you who arrive early! The Swem Library, the Special Collections at the College of William & Mary, will host an Open House for us from 2-4 pm where they will have a number of original Fontaine and Maury family documents on display as well as original letters from Thomas Jefferson, James Monroe, John Marshall, John Tyler, and George Washington, and Marquis de Lafayette. The Special Collections Library is on the first floor of the Swem Library located at 400 Landrum Drive in Williamsburg, 23185. When you arrive at the library, press the buzzer to gain entrance and tell them that you are there for the Special Collections Open House. The library is about 2.5 miles from our hotel; parking is limited to a small number of metered parking spaces behind the library and in front of the nearby Muscarelle Museum of Art whose address is 603 Jamestown Road. There are a few handicapped parking spaces behind the library with entrance at Loading Dock #1. There are downloadable maps at the bottom of the William & Mary webpage. Uber, Lift and taxi services are available. We will have an all-day tour on Saturday, October 20, from 9 am to 4:30 pm. We will first go to the Yorktown Visitors Center for a 15 minute film, a visit to the museum, and part of the battlefield grounds. From there we will go to Grace Church where the Reverend Francis Fontaine was rector from 1722 until his death in 1749. He is believed to be buried in the graveyard there. A docent will give us a short talk followed by a tour, then we will have a boxed lunch there. After lunch we will tour part of the Yorktown battlefield – Moore House where the 1781 surrender terms were discussed, the surrender field itself, and the French artillery battery. We will also witness a special reenactment of a British unit firing artillery. From there we will go to the Custom House in downtown Yorktown. Built around l720, it was the clearing house for processing immigrants arriving in Yorktown. James Fontaine, his wife, and daughter landed in Yorktown in October 1717. The house is owned and operated by the local chapter of the Daughters of the American Revolution. They will provide us a talk on the immigrant experience in those early days which would be applicable to all five Fontaine siblings and their families who arrived at various ports in the area. We will be divided into groups in order to tour the house. We will return to the hotel by 4:30 pm and reconvene at 6:30 pm in the Petersburg conference room in the hotel for our annual dinner. Our keynote speaker will be the director of the Special Collections at the College of William & Mary who will discuss the university’s extraordinary Fontaine and Maury holdings in their Special Collections. His talk will include a presentation showing images from the collection and the university’s on-going digitation program. A registration form is included; please print and send your completed form, with a check or money order made payable to “The Fontaine Maury Society” to the address listed by September 19, 2018. Please come for what will be a very interesting weekend! Details on Separate October 19 Yorktown Day Events! Our annual meeting weekend of October 19-21, 2017, in Yorktown, Virginia, coincides with the annual Yorktown Day which commemorates the October 19, 1781, British surrender to the Americans effectively ending the American Revolution. Please consider coming early for our weekend so you can participate in these festivities which are separate from our Society’s planned events. In addition to visiting the Swem Library in the afternoon to view papers relevant to our family, you may wish to visit the Town of York, the Nelson House, the Watermen’s Museum, the Gallery at York Hall, the York County Historical Museum, and the American Revolution Museum at Yorktown. You may also wish to visit Riverwalk Landing along the Yorktown waterfront, where the schooners Alliance and Serenity are docked. For up-to-date details on Yorktown Day events, periodically check the Yorktown Day webpage. Call for Nominations or Volunteers for Society Leadership Positions! At our annual business meeting each year, we do a call for nominations for elected positions and volunteers for positions on the Executive Committee consistent with our By-Laws. Those positions held by elected officials are the President and Vice President, for two year terms, and three Directors each for three year terms. Our permanent positions based on volunteers are the secretary, treasurer, librarian, newsletter editor, membership secretary, and webmaster. Our upcoming election at the annual business meeting on October 19, 2018, in Yorktown, Virginia, will be for the positions of President and Vice President as our current officers are both ending their second two-year terms. One of the three director positions will also be open. Directors typically help on different projects on behalf of the Executive Committee. We are also seeking a volunteer for the position of secretary. We currently have someone who has kindly served in this position in an acting capacity until a permanent secretary can be found. We need an active Executive Committee to help us continue the Society’s activities; we also want to help bring in more young people to encourage the next generation to carry on all the good work done by our current and prior membership. If you would like to submit a nomination or volunteer, please contact the Society’s librarian BHNilsson (at) aol.com who will put you in touch with the Executive Committee leadership subcommittee. Original Francis Fontaine (1721-1785) Signature! On Tuesday, 14 August 1750, Francis “Frank” Fontaine (1721-1785) witnessed the will of Elias Dupee in Newbern, North Carolina. Frank would have been 28 years old. He appeared in the Craven County Court of Pleas & Quarter Sessions almost four years later, on Thursday, 14 February 1754, testifying that he had witnessed Elias sign his will. The attached photo is of his original signature on the 1750 will, found in the North Carolina Department of Archives and History. An exciting find of a document handled by an ancestor and that contains an original signature! Thank you to George Weed for donating his 1853 1st edition of Ann Maury’s sponsored translation of the Memoirs and his 1941 edition of Ann Maury’s Intimate Virginiana. Both are welcome keepsakes of the Fontaine Maury family history! The Society’s annual meeting will take place on Friday-Sunday, October 19-21, 2018, in Yorktown, Virginia. The theme will focus on descendants from several of the five Fontaine siblings who settled in Virginia from Ireland, as well as the family’s role in the Revolutionary War and in Yorktown. Our events will include participation in the annual Yorktown Day festivities on October 19, which includes a parade, fifes and drums performances and special programs that commemorate the 236th anniversary of America’s Revolutionary War victory over the British at Yorktown. All five of the Fontaine siblings who came to America landed in the area of our meeting, with a number of family members specifically being at Yorktown. James Fontaine (1686-1745) and his wife Lucretia Desjarrie and their daughter Elizabeth landed in Yorktown in October 1717 where James’ brother John Fontaine (1693-1767) met them and took them home to the family plantation John had established. 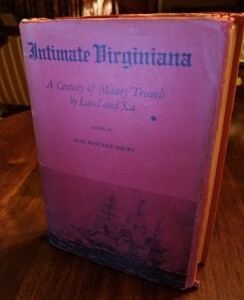 Their brother Francis Fontaine (1697-1749) and his wife Mary Glenisson followed, arriving in Virginia in May 1719. Francis became the Rector of York-Hampton Parish two years later, in 1723, and remained in this role until his death in 1749. He preached in Grace Church in Yorktown and is believed to be buried in the churchyard. A number of family members were in Yorktown on that fateful day of October 19, 1781, when the British surrendered to the Army of General George Washington. Lt. Col. William Fontaine (1753-1810), grandson of another of the five siblings, the Reverend Peter Fontaine (1691-1810), was with Washington and wrote about the surrender. William’s brother, John Fontaine (1750-1792), was there as well with his Henry County, Virginia (VA), militia unit, as well as their uncle Aaron Fontaine (1753-1823) who was there as part of his Louisa County VA militia unit. Aaron’s future son-in-law, Edmund Bullock (1763-1852), was there with his Hanover County VA militia unit; the two men knew each other even though Edmond did not marry Aaron’s daughter until they were all living in Kentucky. Our weekend will be at the Fort Magruder Hotel, located at 6945 Pocahontas Trail, in Williamsburg VA 23185. The hotel has offered the Society a special group rate of $109.00 per night; a state tax and a $2.00 occupancy tax will be added. The hotel rate is applicable for two nights prior to our weekend and two nights after, for those who may want to spend more time in the area. Breakfast is not included but we are working on a special rate to have breakfast in our group room each morning for those who wish to do so. The hotel is convenient to many sites, being only one mile from the College of William & Mary, seven miles from Jamestown, and nine miles from the Yorktown Battlefield Visitors Center. The hotel is 40 miles from the airports at Richmond and at Norfolk, and only 2.5 miles from the Amtrak train station. To make your hotel reservation, call the hotel at 757-220-2250; remember to ask for the Fontaine Maury Society group rate! Our annual meeting at the hotel on Friday night will include a short presentation about the family’s role in the British surrender at Yorktown. We are still finalizing a full day tour on Saturday that will include Grace Church. Our annual dinner on Saturday night will be at the hotel. Our keynote speaker will be Jay Gaidmore, Director of Special Collections at the College of William & Mary. He will discuss the university’s extraordinary Fontaine and Maury holdings in their Special Collections. His talk will include a presentation showing images from the collection and the university’s on-going digitation program. We will have more details, including the registration form, in the summer newsletter and on our web page! Reminder Your Membership is Tax Deductible! As we approach April 15, 2018, please be reminded the Society became a non-profit public charity under Internal Revenue Code (IRC) Section 501(c)(3) as of 17 February 2015. This means that your donations to the Society, including your membership dues and any expenses to travel to and attend the annual meeting, are tax deductible under IRC Section 170. Should you have any questions about how to do this, we recommend that you contact your accountant or local IRS office. This is a great opportunity to remind people to pay their dues for 2018 so you can deduct them in 2019!